When we’ve asked the troops what we can do for them, a common, and typically selfless theme runs through their responses. The troops say they are getting the support they need, but their primary concerns usually revolve around their families and those emergencies, large and small, that arise at home. When a single parent was out of work as a result of a car accident, we were able to help with rent and utility payments. After a soldier’s day-old baby died, we helped to pay the funeral expenses. When a soldier’s father passed away in Miami and he could not afford to travel, we paid his expenses. We helped to pay the food, rent and utility bills for a single parent who had to miss work to care for a sick child. We provided a grant to help a family get back on their feet after a house fire destroyed everything. The Georgia National Guard Family Support Foundation, Inc. is a non-profit 501 (c) (3) corporation established in 1994 to provide emergency relief assistance during times of financial crisis to the members and families of the Georgia National Guard and full-time federal/state civilian employees of the Georgia Department of Defense living in the State of Georgia. Although not a military organization, the Foundation is recognized as an official support organization of the Georgia National Guard. Service Members have received emergency assistance, i.e. payments to avoid eviction, foreclosure, utilities disconnection and repossession of vehicles. Throughout inception, the Foundation has assisted victims of house and apartment fires, tornadoes, floods and other natural disasters. Eligible members have received emergency travel and funeral expenses assistance. The Foundation has supported Guard members injured during deployment and training or experiencing temporary pay problems. These are examples of the multiple requests the Foundation receives each week. As a result of contributions, both large and small, we have been able to approve over $2.8 million in assistance to more than 3,200 applicants. We hope you will consider making a contribution to the Foundation to help Guard families in need. You can contribute by credit card on this website; you can “pick an amount and make it count” on Tax Form 500 when you file your State of Georgia Income Taxes as the Foundation is one of nine approved tax “check-off” charities in the State; Federal employees can contribute through the annual Combined Federal Campaign (CFC Agency Code # 70602); state employees can contribute through the annual State of Georgia Charitable Contributions Program (SCCP Agency Code # 177000), or you can simply mail a donation. Thank you for your interest and support! 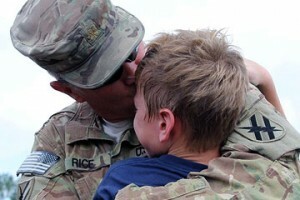 Your donation will help make a difference in the lives of Georgia military members.